After a slew of catastrophic injuries in Week 1, few skill position players suffered significant injuries in Week 2. Despite a relatively clean week, a few players continue to suffer through nagging conditions, while others look to make their season debuts. Here is everything you need to know about NFL injuries going into Week 3. Late in Week 1 Devonta Freeman sustained a knee injury that caused him to miss the remainder of the game, as well as Week 2. Coach Dan Quinn said that Freeman aggravated a PCL/MCL originally sustained in 2017. At first, sources reported that Freeman would miss only 2-3 weeks, but Quinn then commented that he is not sure on Freeman's timetable for recovery. Freeman should be expected to miss multiple weeks at the very least. After sustaining an elbow injury in Week 1, Marcus Mariota didn't play a snap in Week 2 despite suiting up. Dealing with a nerve issue, coach Mike Vrabel said after the game that Mariota's status has not changed. This makes Mariota questionable at best for Week 3. Aside from his blockbuster trade to New England, Josh Gordon sat out of Week 2's game with a hamstring injury. Gordon initially sustained the injury during a promotional shoot. Gordon received an MRI on his hamstring and it reportedly checked out. He is eligible to play as soon as Week 3, but practice reports should be monitored leading up to the game. Leonard Fournette injured his hamstring during the second quarter of Week 1's game, before being ruled out shortly thereafter. Fournette's availability went down to the wire before the Jags ruled him out. However, Fournette failed to practice all last week, making him questionable at best for Week 3. 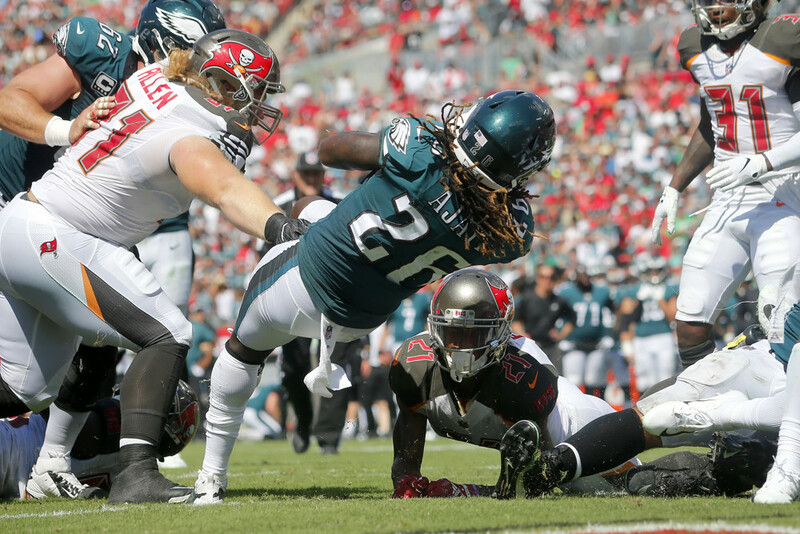 After suffering a back injury in the first half of Sunday's game, Jay Ajayi miraculously returned to finish out the contest. Since the game the Eagles promoted rookie Josh Adams from the practice squad and offensive coordinator Mike Groh said there was a good chance that Ajayi will sit in Week 3. Ajayi should be considered doubtful until practice reports come out, but this stings for an Eagles offense already struggling with injuries. Marquise Goodwin suffered a quad injury in the second quarter of Week 1's game. Goodwin briefly returned, but ended up missing the end of the game and the 49er's Week 2 game. If Goodwin can't practice this week, he will more than likely sit out his second consecutive game. Late in Sunday's game, LeSean McCoy checked out with a rib injury. Per Adam Schefter, McCoy is dealing with cracked rib cartilage. Schefter also reported that McCoy has played through this injury before and will not miss more than one game tops. Legitimately questionable at this point, practice will be paramount for McCoy. After playing through a knee issue in Thursday night's game, Joe Mixon underwent a cleanup procedure to remedy the issue. The surgery comes with a 2-4 week recovery. The good news is that Mixon will stay on the active roster, but Giovani Bernard will operate as the Bengals' feature back in the meantime. Early in Sunday's game Mike Wallace suffered a gruesome lower leg injury and had to be carted off the field. Coach Doug Pederson told the media on Monday that Wallace fractured his fibula. The Eagles placed Wallace on injured reserve, but he could theoretically come back after 8 weeks. It's possible Wallace has played his final snaps of 2018. Carson Wentz After tearing his ACL late in 2017, doctors finally cleared Carson Wentz for contact. Wentz will start Week 3 and provide a huge upgrade for a struggling Philadelphia offense against a weak Colts secondary.